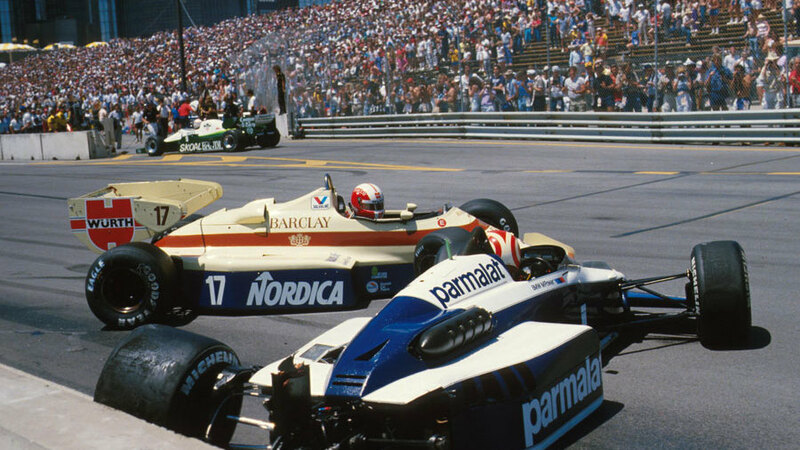 Nelson Piquet proved his win in Montreal had been no fluke with victory at the USA Grand Prix in Detroit for his second win in eight days. After six rounds where he had failed to score a point, the turbo-charged Brabham's new reliability lifted him to fourth in the drivers' championship. Mario Andretti had been summoned by Renault as a possible replacement for Patrick Tambay who had fractured his leg in a crash at Monaco three weeks earlier, but a hobbling Tambay declared himself fit. The street-circuit race needed a restart after Nigel Mansell wiped out both the cars on the front row - Piquet and Alain Prost's McLaren - seconds after the start, as he sought a gap that wasn't there. This set off a chain reaction in which Michele Alboreto's Ferrari was also hit, Piquet's detached wheel hit Ayrton Senna's Toleman, and Marc Surer could not steer his Arrows clear of Piquet's spinning Brabham. The organisers immediately halted the race and all bar the hapless Surer again took their places. Piquet took over the spare Brabham but the accident with Surer had left him with a badly jarred neck and he raced in great discomfort. He took a lead he was never to lose as the lights went out for a second time after a 35-minute delay and headed Prost to turn one with Mansell's Lotus moving ahead of Prost after 10 laps. Mansell then pushed on and caught Piquet, helped in part by the Brazilian dropping his pace to look after fuel, but he lost second gear on lap 25 and then the Lotus's gearbox failed completely three laps later handing second to team-mate Elio de Angelis. His day got worse when he was fined $6000 for causing the first accident. The battle for the other point-scoring places changed repeatedly as a succession of cars retired. Derek Warwick broke the lap record and was in third when his gearbox died and so at the two-thirds mark only eight of the 26 starters were still going. "It was more like a destruction derby than a world championship race," wrote John Blunsden in The Times. Martin Brundle in his Tyrrell had been working his way through the field and seven laps from the end he passed de Angelis' ailing Lotus. He then ate five seconds a lap out of Piquet's lead. On the final half mile he closed to within feet of Piquet who had until then been cruising. However, shortly after the podium presentations it emerged officials had found impurities in Brundle's water injection system and lead balls in the bed containing the water. Although the team left Detroit with their points intact, three weeks later FISA ruled Tyrrell had illegally refuelled during the race and all the team's points for the season were wiped out. It continued to race for the remainder of the year but was unable to score. As a result, de Angelis was restored to second and the other Brabham of Teo Fabi was promoted to third - it was to be Fabi's only top three finish and so he never got to stand on a podium - but with only five cars finishing there was no point awarded for sixth place.